After my few months of Smith & Deli sandwich consumption, I need to get back to some lighter eating. The weather has warmed up so it seems right for salads to make a big comeback in my diet. This one I discovered at a dinner at my sister’s a few months ago. I’ve been meaning to make it since. 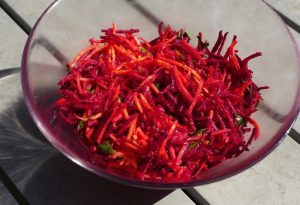 It is a simple grated carrot and beetroot salad with a garlicky vinaigrette dill dressing. 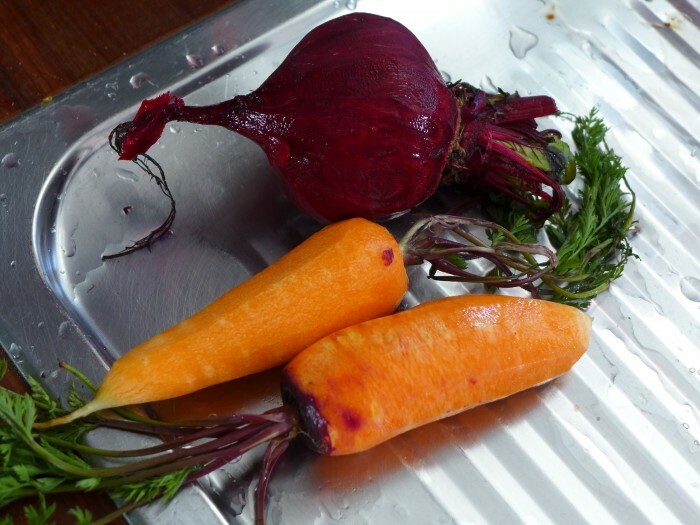 I was clearing the garden beds for the spring planting and removed the last of the carrots and beetroot and this salad immediately came to mind. The carrots are some beautiful heirloom ones, purple on the outside and orange inside. It is a combination of sweet, earthy and bright flavours and much more than the sum of its parts. The dill really makes it. It’s such a delicious and beautiful way to eat your veggies. Combine the vegetables and herbs in a bowl. Add as much of the vinaigrette as you like and toss. This looks and sounds right up my alley! LOVE the color and the popping flavor potential! Nice! I found your blog thru the Randomizer for MoFo. I miss it already. There are some of us that are continuing to blog and hop if you are interested! Swing by my place when and if you have the chance! Would love to connect!